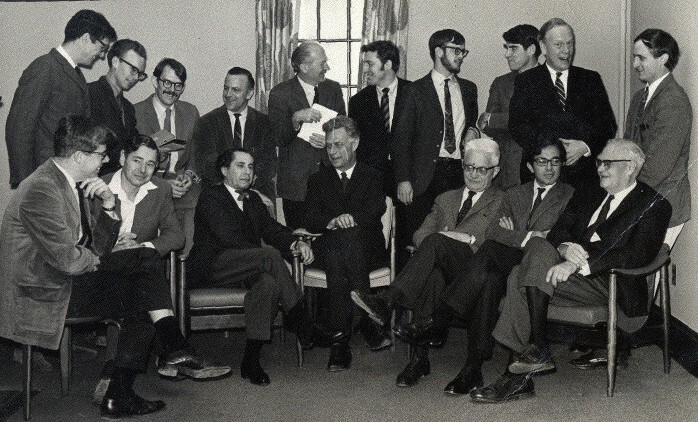 In 1968, the full professors were Donald Davidson, Stuart Hampshire, Carl Hempel, Walter Kaufmann, Thomas Kuhn, James Ward Smith, Gregory Vlastos, and Ledger Wood; the associate professors were Paul Benacerraf, George Pitcher, Richard Rorty, and Arthur Szathmary; the assistant professors were Richard Grandy, Gilbert Harman, Tom Nagel, Terry Penner, Larry Sklar, and John Wallace; and Tim Scanlon was a lecturer. Stuart Hampshire was the chair of the department, having moved four years earlier from the University of London where he had been Grote Professor of Philosophy. Gregory Vlastos had been chair for the first half of the sixties, and he was chair again for the first half of the next decade. His influence with the University's administration was primarily responsible for the emergence of philosophy at Princeton to a position of international prominence. The Three Lecture Series, later the Carl G. Hempel Lectures, began at the beginning of the sixties when the lectures were given by Norman Malcolm. They were next given by Saul Kripke in 1969-70, who gave them again in 1974-75. Kripke’s first Three Lecture Series was subsequently published as Naming and Necessity. At the end of the sixties, Donald Davidson took over as chair of the department from Vlastos. Gil Harman later recalled Davidson's role in the department, and in philosophy more generally, during the 60s and 70s, and his recollection can be read here.